A while back I mentioned how I actually prefer a tomato-sauce-less pizza, because sometimes the tang of the sauce can be too strong, or other times there is so much that it drowns the whole pie. So most times I opt to use a pesto sauce instead of tomato, and came up with the simple recipe for a Tomato Pesto Pizza. Here again, is another easy way to build a pizza without tomato sauce. 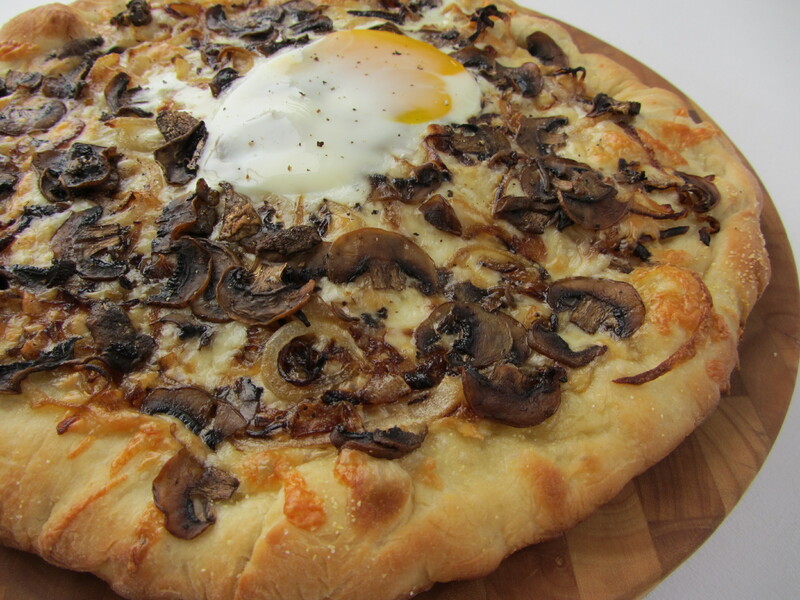 By caramelizing the onions and using a drizzle of truffle oil, those two things will not only make up for the lack of sauce, but the flavor combination of the two with the mushrooms and egg is simply divine. 2. While the dough is resting, cook the onions. Heat 1 tablespoon of olive oil in a skillet over medium heat, then add the onions, a pinch of salt, and cook until translucent until onions have browned, about 10-15 minutes. Remove from heat, set aside. 3. Toss the sliced mushrooms in a large bowl with 1 tablespoon of olive oil. Set aside. 4. Gently stretch (or roll) the dough out into a 12-14 inch circle, and place onto a lightly greased baking sheet sprinkled with a couple pinches of cornmeal. Brush top with olive oil and sprinkle some more cornmeal on the crust. Spread the shredded mozzarella cheese on the dough, then the caramelized onions, and then the mushrooms. Drizzle the truffle oil evenly over the toppings. 5. Bake at 450F until the crust is just lightly golden, about 8-10 minutes, then remove from oven, and crack the egg over the center. Return to oven and bake until egg is cooked, about 5 minutes more. Season to taste with salt and pepper, if desired. * The cornmeal adds a rustic touch, but also helps to keep the pizza from sticking to the pan. * Cracking an egg onto pizza might be strange to us in the USA, but is a common practice in Italy. * Ok, so I cheated with the onions. For a proper method, read my recipe on How to Caramelize Onions. This was my dinner tonight! Great idea with the egg, though. I did carmelized onion, spinach and garlic, sauteed mushroom and bits of blue cheese. A few sprinkled walnuts on top, too. A bit crazy, but delicious! I like the simplicity of yours, though. Looks delicious! Thank you! The great thing about pizza is, you can put on it anything your heart (or stomach) desires!